Yuda Schloss at work at his Crown Heights apartment. 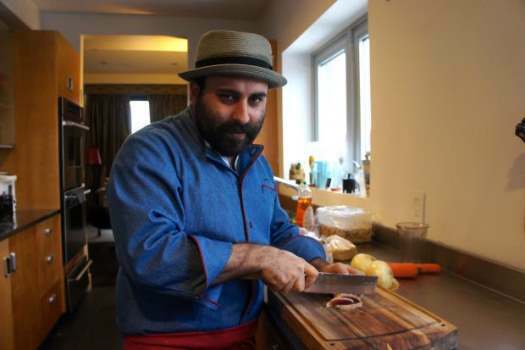 Orthodox chef Yuda Schloss knows his way around bacon — lamb bacon, that is. The self-described hipster is the culinary force behind new pop-up eatery Hassid+Hipster, whose handcrafted artisanal kosher sandwiches have been generating a buzz in Crown Heights’ Chabad-Lubavitch Hasidic community. 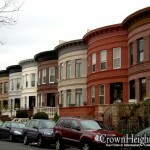 “Hasidic to me is something that’s traditional and old and hipster is something new. That’s what I try to do with everything,” said Schloss, 30, who launched the takeout-only sandwich shop from his apartment at Eastern Parkway and Albany Avenue last month. Hassid+Hipster’s $15 pulled brisket sandwich comes topped with roasted cauliflower, charred mandarin and green onion marmalade — just one item on a constantly rotating menu that also recently included lamb ramen, duck prosciutto and quinoa dumplings. Schloss announces his offerings and takes orders over Facebook, and then he opens his home for a few hours twice a week so that hungry Brooklynites can pick up their selections. He has more than 600 fans on Facebook and said he serves roughly 70 diners each day he is open. Schloss himself has spent nearly a decade in the food business, beginning with The Fresh Diet, a Brooklyn-based company that delivers nutritious food. 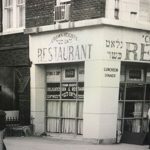 His father ran Manhattan macrobiotic restaurant The Cauldron, making the meat-heavy menu at Hassid+Hipster something of a rebellion for the young cook. But running a small business out of his home is not without its challenges, Schloss said. Because he doesn’t have a formal restaurant, Schloss can’t get a hechsher, a certificate of kosher supervision that many Orthodox diners demand as proof that their meal’s provenance and preparation adhere to strict Jewish dietary laws. “Normally I would need it, but kosher supervision would not give it in someone’s house because they don’t observe it 24 hours a day so they don’t know what you’re doing when they’re not there,” the chef explained. The city’s Health Department, too, said diners should be leery of an informal food establishment that is not under the city’s supervision. “Home-based food service establishments are illegal throughout New York State. Because they are unregulated and uninspected, they may pose a health threat to diners,” the department wrote in a statement, while declining to comment on Hassid+Hipster specifically. But some diners say the unique experience at Hassid+Hipster outweighs the potential health risks. Schloss said his early accolades are making him think about opening a real restaurant in the area. “I got people from LA and Miami saying, ‘When could you come over here and do a pop-up week over here?’ If I could continuously get that kind of reaction out of people, then I know that I have what it takes to maybe do something casual in this neighborhood,” Schloss said. Video: Can You Identify the Beard? Hip or Hassid? Seriously chavera, schunah, crownheighters whats going on??? 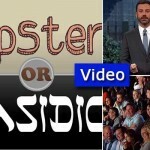 Everything we see, hear, do is now becoming “hipster” “first chassidish” what’s next??? You really do need to get out more. Hipsters have always made good news stories, but they rarely ever carry this into adulthood, and there really aren’t very many of them. Jewish hipsters are sanctimonious and shallow, living in a spiritual world of shiny and cliché, but they are generally well meaning and at the very least mentally sublimate their material desires in a veneer of sophistication and popular spirituality. The worst thing you can do for them is to take them too seriously. Isn’t he the one that was featured in the WSJ trying out food in people’s homes?? Is it him or his brother, that was in the article? Juda, keep it up. You are giving people a real foodie expiriance which is something we didn’t get growing up in this neighborhood. nice ”inspiration” for our kids. Chasid hipster. whats next. At least don’t use these labels. This is like the ”reconstructionist” form of lubavitch. I really enjoyed the sandwich! Yuda please ignore these trolls. They have miserable lives and take their anger out anonymously online. Looking forward to my next purchase from you soon! Wow, you’re right, why did I never think of it before – ‘g-d send ‘ really is the perfect phrase for a new food establishment! I didn’t know chassidishkeit is being so involve in food. So far from the Alter Rebbe’s teaching. Did we loose our brakes ??????????? Did we ever see a goy koshering his meat to mime us ? Mr. Yuda doesn’t need a hechsher because he is a hassid+hipster what knows bacon. Yuda you are awesome and these comments are from low life losers who don’t know the first thing about what it means to be Lubavitch. Keep it up man!! I had his food and it was amazing but then I heard about the wsj article and that he had been to these parties where supposedly he ate non kosher food. I cant say if this is true or not but till someone verifies it or he gets some kind of hechsher I wont continue eating his food – im just uncomfortable…..
Why do you have to call it bacon? Can’t you be more original and think up something new, like mockbacon or the like. Macrobiotics, since you mention this, has always gone into peoples home and cooked privately. How about because bacon is what it is? Not pig bacon, but beef or veal or turkey bacon, or whatever it is. It isn’t mock anything, or fake anything. to #17 what about the article was worrying ? where do you see anything about it being not kosher? the author mentions something about another dinner with porkbelly .. this one he was at had salmon and chicken kabobs..
and yea.. Yuda’s food rocks. Far more inventive than the suchi at the bakery, or gumbos.. is it a bit out there for most of CH .. too bad . dont eat it. AS you can see CH has expanded far beyond the boundries of what you may all be comfortable with .. not all being done under the auspices of official chabad but by people who affiliate with chabad with varying degrees… You can no longer ignore it and have no choice but to embrace .. becasue we are coming .. and fast. The Chabad house model and motto of everyone is welcome is only outside of CH? Do you have a reading disability, or are you just a careless reader? The article couldn’t be any clearer: The dinner “Yuda Schlass” and his roommate Yossi Levin attended featured “overexposed foods that should be retired: pork belly, kale, cupcakes”. No mention of salmon or chicken at that dinner (not that these would have been kosher either). The “Chabad house model and motto of everyone is welcome” is irrelevant; the question is how one can trust the kashrus of someone who eats treif? It may be kosher but I’d be hesitant in eating any type of bacon as I automatically associate bacon with pork. And I automatically associate pork with חזיר, and thus with the geulah, when עתיד הקב״ה להחזירה לנו. So it’s a positive association! I can’t understand why anyone would refrain from eating something just because it reminds them of a forbidden food. For everything Hashem forbade us, He provided us with a permitted substitute; why would we not take advantage of that? I’m not saying to be a baal tayva and go seeking them out, but if they happen to be to hand why would you deliberately avoid them when Hashem deliberately gave them to you? When someone tells me I’m doing something wrong or inappropriate, I am grateful. When someone points out a halachah to me that I didn’t know I am grateful. When someone tells me that what I’m doing can lead to not good things, I am thankful. Therefore, I cannot understand why anyone who disagrees with a “hipster” and where “hipsterism” is taking us is a HATER, LOSER, LOWLIFE, NOT WITH THE PROGRAM, etc. Can someone explain that to me? We’ve been following Chassidus and chassidic lifestyle for over 300 plus years, and suddenly young folks barely starting mature life know something the rest of us just don’t know… that the Baal Shem Tov, the Maggid of Mezritch, the Alter Rebbe, the Mitteler Rebbe, the Tzemach Tzedek, the Rebbe Rashab, the Frierdiker Rebbe and the Rebbe didn’t know? Do you know there was a recent “community” event where frum Yidden and nit Yidden playing steel drums hung out together to “get to know each other better”? Aibishter!!! Being in the meat business, I can certify that lamb bacon is on the top of the do not eat foods for health reasons because of the way it is made. It is akin to its kosher cousin, kosher beef-fry. Pig bacon isn’t all that healthy either! But by all accounts it’s delicious, and in moderation it won’t do you any harm; I’m sure the same is true for the lamb, beef, and turkey versions. The dangers of saturated fats have been vastly exaggerated.